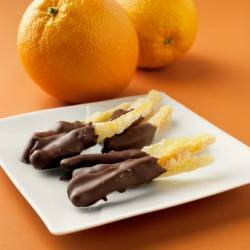 When you want to make something really special for your friends or family, these scrumptious chocolate dipped candied orange peels are just the thing. They also make a great holiday gift. Wrap in clear or colored cellophane paper and tie with a pretty ribbon and give for Easter, Christmas, Hanukkah, or for a special birthday gift. Using a serrated knife or other sharp knife, cut a thin slice off the top and bottom of each orange to expose the flesh. Score the peel of each orange into quarters, cutting through the white pith, and pull the quarters of peel off the orange. Using a sharp spoon, scrape off any stringy membranes from the inside of the peel (do not scrape off the white pith). Cut each quarter crosswise into 1/4-inch-wide strips. Put the orange peel in a large heavy saucepan, add cold water to cover and bring to a boil. Drain. Repeat two more times (blanching the peel removes the bitterness). Return the orange peel to the saucepan, add cold water to cover by about 1 inch and bring to a boil. Reduce the heat and simmer gently, stirring occasionally, until the peel is tender when pierced with a knife, about 15 minutes. Drain and set aside. Set a large wire rack, preferably mesh, over a baking sheet. Combine the corn syrup, sugar and water in the same saucepan in which you blanched the peel and bring to a boil, stirring to dissolve the sugar. Wash down the sides of the pan with a wet pastry brush to remove any sugar crystals (which could cause the syrup to crystallize) and add the orange peel. Melt the chocolate over a double boiler, dip the orange peels (either the whole orange peel or dip only one end of each peel) and let dry on a wire rack. Place approximately 75 percent of the chocolate, roughly chopped, into a glass bowl. Finely chop the rest. Melt the majority of the chocolate over a small saucepan of water, being careful not to let any water fall on the chocolate, until it registers a temperature between 115 degrees and 120 degrees F. Set the bowl aside for 10 minutes. After the 10 minutes, give the chocolate a good stir and add handfuls of the finely chopped remaining chocolate to the warm, melted chocolate. Slowly incorporate each handful of chopped chocolate into the melted chocolate by stirring it in completely until smooth. Using a digital, instant-read or chocolate thermometer, test the liquid chocolate after fully incorporating each handful of chopped chocolate, until it drops to 86 degrees F.
Finally, carefully reheat the cooled chocolate over the double boiler until it reaches 99 degrees F. The chocolate is now tempered, and it will set up smoothly and quickly when the rinds are dipped.